Rev. Ebenezer W. Warren, b. 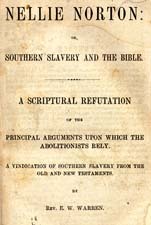 1820 Nellie Norton: or, Southern Slavery and the Bible. A Scriptural Refutation of the Principal Arguments upon which the Abolitionists Rely. A Vindication of Southern Slavery from the Old and New Testaments. Nellie Norton: or, Southern Slavery and the Bible. A Scriptural Refutation of the Principal Arguments upon which the Abolitionists Rely. A Vindication of Southern Slavery from the Old and New Testaments. Macon, Ga.: Burke, Boykin & Company, 1864.